A great social media presence is now crucial for both large and small businesses. In fact, last year 93% of marketers use social media for business. People follow company social media accounts to stay updated on the latest news and developments. They look to be heard, entertained and informed. As social media continues to become a necessary practice for marketers, here are some of the key actions to implement in your social media strategy that will add value to their lives in some meaningful way while letting your brand voice shine. 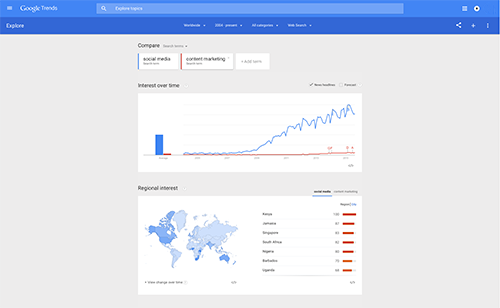 Google Trends: Create your social content strategy by seeing the progression of the trends in your industry. Search multiple topics and easily compare searches that look to be diminishing and those that are rising in popularity. Further finesse your search by indicating the time, category, media, and location of your inquires. Take advantage of the related search section where you can see what else your target audience looks for. At a minimum, check the trends at least once a month. Develop your list of words by staying updated on the latest trends. 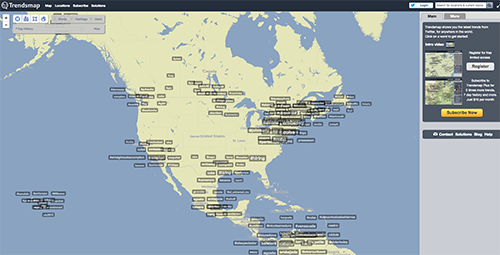 Trends Map: Leverage relevant trending hashtags and mentions on Twitter in your location. If you see a cause that aligns with your brand, contribute to the conversation and share it across your social media channels, specifically Twitter. Keep a list of trends and keywords and search for the conversation on Twitter. Track the trend and get involved at a minimum of once a week. Flip Board: Find trends within this digital magazine platform by curating a list top stories and resources in your industry. Search for a topic, find related articles and magazines from trusted sources of your target market. 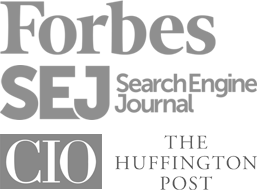 Share and pull news you find important to your brand voice regardless of the industry. Sometimes thinking outside the box is how you will attract new followers and optimize your brand voice. Learn their language, adopt it, and make sure this tone feels natural and honest to you on all your platforms. Intriguing – entice your audience with mystery and riveting information. Let’s see how Buzzfeed incorporates some of these characteristics into their social media accounts as a news and entertainment company. LinkedIn: Promoting company growth and events. Establishing a community that is less seen as a company and more of a culture. Their tone is similar to their other channels, being relatable and transferable, but distinct in originality and smart in knowing how to still integrate their brand voice in a more professional and business setting. Twitter: Distinctly targeted towards a generation between teens to those in their late 20s. A majority of their tweets come from the stories published from all their other categorized channels, in a voice that generates shock in its directness and curiosity in a unique story not often published by a major news outlet. Balancing anti-social norm stories with all news related to celebrities, popculture, life hacks, and lifestyles. Facebook: Publishes content “worth sharing”. From short to long reads, listicles and stories of serious to funny content, Buzzfeed creates news and entertainment people can relate to or learn from. Instagram: Dedicating an entire account to funny content from internet sites and apps. Sharing posts from Reddit, Twitter, Tumblr, and Repost app, that will perk up your day, and give you a good chuckle. Continuing to showcase trends and pop culture references like cats, celebrity memes, pizza love, and funny life events. There is a distinct consistency in Buzzfeed’s LinkedIn and Twitter accounts, promoting themselves less as a company and news leader, and more as a culture and community spokesperson. As you cultivate a list of words, phrases and topics you can reference for social media you may have to adjust your marketing guidelines and content strategy to progress with the latest in your industry. Ensure that whatever changes you make, your key company values/mission aren’t compromised. 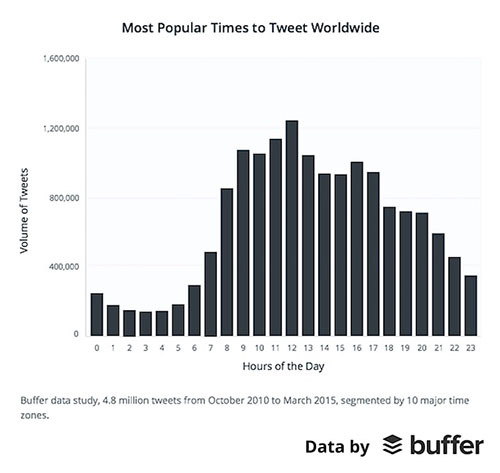 Source: Buffer’s social media study. To build a following that are loyal and long-term, listen, track, and adapt your content strategy to your audience’s habits. People love consistency and being provided with valuable content. There are a few tools out there that will help you find the best times to post and give you insights on who your readers really are on all your social media channels. Always write and share content for your readers, which should naturally represent your brand online. Make sure your hashtags, images, and optimization techniques relate to your audience. Especially important in establishing your brand voice is how you want your audience to feel when they see your post in comparison to how they know your brand. There is no other aspect more impactful than to successfully make your audience emote. It establishes a personal connection with your brand, not directly achievable by any tool or algorithm. KitKat’s longstanding and well-known slogan, “Have A Break, Have a KitKat” is the perfect phrase to use in a hashtag. Their history of marketing a product to combat someone’s busy lifestyle, continues to establish a loyal following as people’s go-to snack. 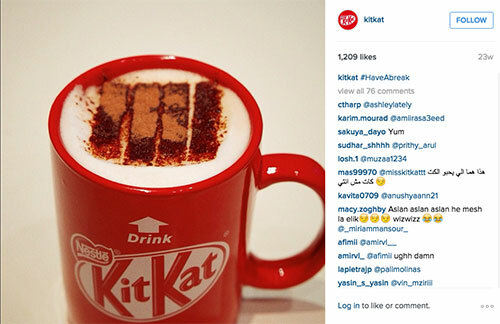 KitKat’s Instagram is the perfect example of a company that has an established brand voice that really resonates with their audience. #HaveABreak is seen in original and fan posts, which are funny, original, creative, product based, and relatable. To help you define your brand voice, image and branding goes a long way. Have a mood board of images and phrases that relates to how you’re suppose to feel when you are making posts. Everyone needs a break from writing content for social media. To exercise your visual muscles, let your writer’s brain rest, and potentially develop more visual material to go along with your posts, integrate a visually creative practice into your social media routine. You can double the takeaway from this exercise by making a mood board of content that can also be used for potential material for your brand’s social media, and as another channel of shareable content if your brand has potential in a more visual setting. A few tools you could use to create your own images include, Canva, PicMonkey, Make A Gif, and BeFunky. Platforms like Pinterest, Tumblr, Juxtapost, and We Heart It are great hosts to your shared and original mood board images. Your brand is you, and social media is the outlet for your voice. Be honest, attentive, and engaging. The most challenging aspect to standing out from the crowd is finding that sweet spot between pushing your brand’s identity and delivering the information. Tell us in the comments below what methods you’ve used to establish your social media presence? Amanda is the Social Media Marketer at Atomic Reach, writing posts, sharing news, and connecting with the community on the daily. Her attempts at clearing her ever-growing reading list continue to be unsuccessful, and she really does believe that sharing is caring.